"I'm not going back to the vet with you today." The deworming shot is an alternative form of the drug that saves you from fighting to get a pill down Tabitha's throat. Although felines sometimes have adverse reactions to deworming medications, most side effects are mild and go away shortly. Sometimes, serious toxic issues can occur. Worms affect almost all cats, no matter how well you take care of your four-legged pals. Tapeworms, roundworms and hookworms are just some of the parasites that thrive inside your feline’s intestinal tract. She can get them by chowing down on an infected rodent, by sharing a litter box with a cat who has worms or, if she is still young, she could have worms passed down from her mother. Your veterinarian will want to evaluate some of Tabitha’s stools to figure out exactly which type of worm is making a nest out of her gut. Once he gets confirmation, he’ll be able to administer a deworming injection, if he determines it will kill the unwanted critters. Shots aren’t always the ideal choice for every type of worm, so it’s best to let your veterinarian handle the medications, rather than purchasing an over-the-counter formula on your own. The most common adverse reactions after deworming are vomitting and diarrhea. Throwing up a few times or having loose stools for a couple days probably isn’t a concern. But if Tabitha is dropping weight quickly or can’t hold anything down, take her to the clinic right away. She could be having a toxic adverse reaction that requires immediate medical attention. While deworming injections are perfectly safe, they are a mild type of poison designed to kill parasites lurking around in your fuzzy buddy’s belly. If you’ve ever had any kind of shot, you probably don’t have an appetite for a while afterwards. The surge of a foreign substance in your system can make you a little woozy. Shots have the same effect for Tabitha. If she doesn’t seem interested in food when you get her home from the vet, try mixing her plain old kibble with wet food to make it a bit more enticing. It may take a day or two, but she’ll return to herself in no time and dive right back into her dish. After getting the deworming injection, Tabitha could have a hard lump in the area she got the shot. A temporary patch of swelling is normal with injections, but in some cases they are a cause for concern. If the mass hasn’t gone away even though she had the deworming shot several months ago, if it continues to get bigger or if it is larger than 2 centimeters, it could be a sarcoma, the Cornell University College of Veterinary Medicine explains. Sarcomas are cancerous tumors that form in the connective tissue at an injection site. Developing sarcomas isn’t common, but if you’re concerned about them, talk with your veterinarian about using a different form of deworming medications, like pills, drops or creams. This way Tabitha can get the medication she needs and you don’t have to worry about monitoring an injection site. Is it Best to Get Two Female Dogs or One Female & One Male? 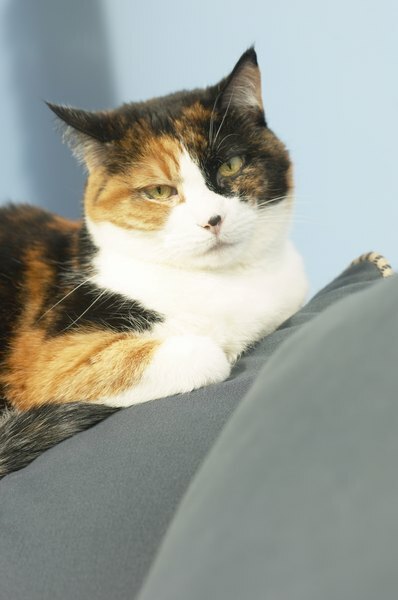 Can Deworming Cause Sickness in Cats?